If you think of USB microphones as flimsy, scaled-down versions of pro XLR mics, think again. Blue’s Yeti is a substantial beast measuring 12 inches high and weighing in at 3.5 pounds (with the stand affixed). 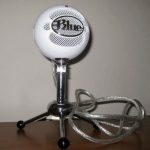 It towers over other wimpy USB mics; including two models offered by Blue: the Snowball and Snowflake. 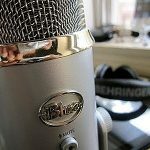 Beyond its intimidating size, the Yeti is a very versatile mic that can record in four different modes. Even ultra-expensive pro microphones don’t offer this many options, making this the greatest strength of the Yeti. Here is a breakdown of each recording mode and what you can do with it. Stereo – Humans have two ears so you could say we are stereo beings. Capturing a sound source in stereo creates a realistic image similar to how you hear it in person. Stereo mode comes in very handy when capturing musical instruments with two distinct parts, like congas. Cardioid – Nearly any mic can record in cardioid mode. Essentially it accepts audio along the front of the mic and rejects sounds that come from behind it. If you’re a podcaster recording your voice solo, this is the mode you’ll be using the majority of the time. Omnidirectional – With this mode it doesn’t matter what direction the sound is coming from. It will indiscriminately pick up everything in the room. This is the mode to use for large groups (that would be impossible to mic separately) or for capturing the ambience of the setting. Bidirectional – During one-on-one interviews you’ll ideally want two mics. Although it’s a little socially uncomfortable (especially with people you don’t know well), you can record two voices from either side of the mic. Sounds that come from the top and bottom, and not left and right are filtered out (to a degree). 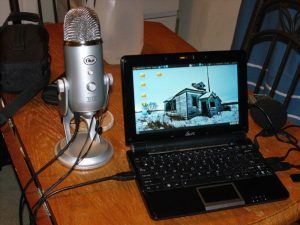 The Yeti is ideal for podcasters that work while seated because of the high-quality, tillable stand. At the bottom of the unit, there is a threaded hole that allows you to connect it to any standard microphone stand. At either side there is a mini-USB input plus a headphone jack. The jack is an absolute must as far as I’m concerned since this gives you direct access to zero-latency monitoring. 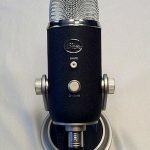 Like most USB mics you are limited to 16-bit/48 kHz recording unless you step up to the Yeti Pro model which offers 24 bit/192 kHz digital recording resolution. For most indie podcasters the standard model is more than ample. 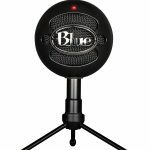 The Yeti Pro is geared toward studios and music applications that require higher bit-rates. Sound quality is well above average for a USB mic. When you put price into consideration, it’s outstanding. Frequencies ranging from 20Hz to 20kHz are picked up, which covers the maximum potential of human hearing. Lows are nice and thick. Highs are clear and smooth. 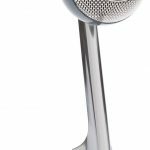 The Yeti is THX certified, which is unusual for a microphone or any type. As far as I can tell this is just a fancy logo placed on the body for dramatic effect. Marketing hype from George Lucas doesn’t carry must weight in the audio engineering industry. Overall the Yeti is very solidly built, thus the weight. The only area to nitpick at is the wobbly volume knob. It feels a bit cheap compared with the rest of the unit. 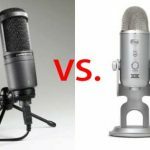 Realistically the Yeti isn’t a pro condenser microphone. I’d rank it as a “prosumer” device, as much as I hate the sound of that phrase. Unless you plan on out-producing P. Ditty, it is also probably the best you will ever need. For what Blue is asking for, this is an absolute steal. 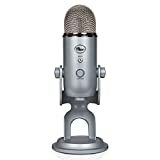 If you are a podcaster without a decent audio interface and microphone, run not walk into your nearest retailer and pick up the Yeti today.